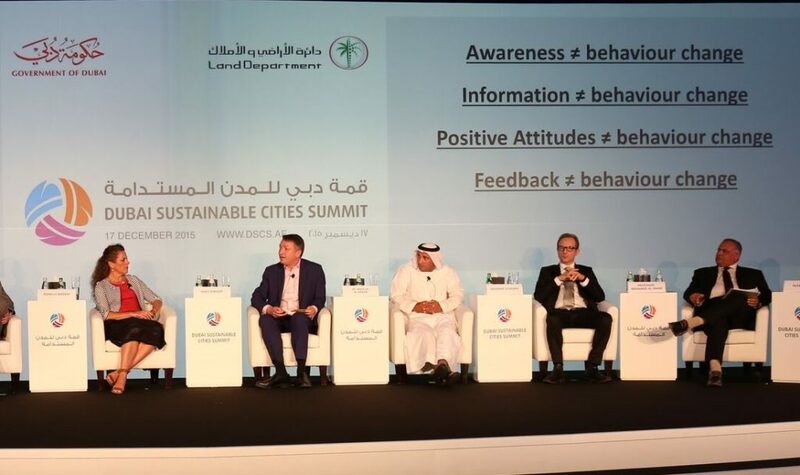 The image above is taken from the Dubai Sustainable Cities Summit where Niall was presenting on the subject of behaviour change (illustrated by the text on the right of the image). The panellists shown above are: (Left to Right), Romily Madew, Chief Executive, Green Building Council of Australia; Niall Enright; Dr. Abdulla Al Karam, Chairman of the Board of Directors and Director General of KHDA; Giovanni Schiuma, Vice Mayor of Matera (European Cultural capital 2019);Professor Mohamed Al Shami, Founder and CEO of Brain Group. We are passionate to communicate the benefits of sustainability. Drawing on our experience working globally on energy and resource efficiency for some of the world’s largest organisations, we hope that our practical outlook, enthusiasm and an extensive understanding of our subject will engage and enlighten the audience. Other conferences where Niall Enright has spoken at include: the prestigious NAESCO and Rocky Mountain Institute Conferences in the US; Automotive Manufactures Conference in Canada; and IAIA08 in Perth, Australia, where Niall was a session chair for Climate Change; the Green Buildings Council Conference in Cape Town in 2009; UNEP FI Global Round Table; the Czech Green Building Council Conference in Prague in 2012. More formal communication of energy and resource efficiency concepts is offered through our training programmes. We have developed a two-day programme that covers Operational Efficiency and Identifying and Driving Projects. We use a workshop approach recognising that adults learn best “by doing”. The numerous worked examples and opportunities to interact enable participants to come away with long-lasting skills and understanding that will help them in their day-to-day challenges. Above all, we hope to convey a enthusiasm and passion for this extraordinarily important subject.